People walk along West South Street during the 2017 Sidney-Shelby County Walk to End Alzheimer’s. 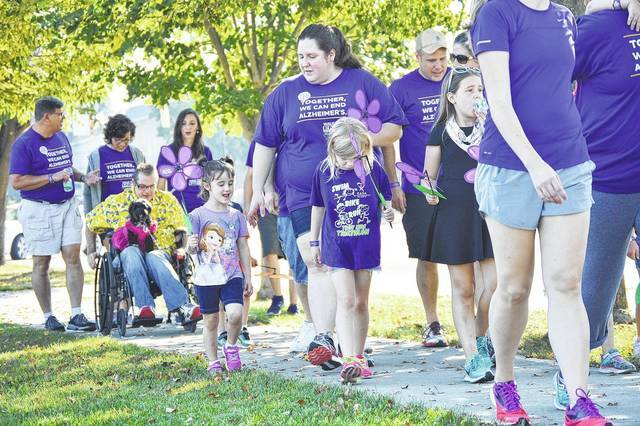 SIDNEY — Sidney’s courtsquare will fill up next weekend with citizens of Sidney and Shelby County to ‘Walk to End Alzheimer’s’ disease, which aims to help educate about the disease and those who are affected by it. Maire Reynolds, Walk to End Alzheimer’s coordinator, says they hope to register over 500 participants on Saturday, Sept. 22, for the Walk this year with a goal to raise $60,000. “We call it our largest support group, because no other place will you have 500 people together to all support the same cause,” Reynolds said. In addition to the 2-mile walk, participants learn about Alzheimer’s disease and how to get involved with advocacy opportunities, the latest in Alzheimer’s research and clinical trials and support programs and services. A general term for memory loss and the most common form for dementia, is called Alzheimer’s disease and accounts for 60 to 80 percent of dementia cases. Alzheimer’s disease develops when brain cells stop functioning and eventually die, resulting in cognitive decline. It’s a progressive, irreversible disorder of the brain and can severely impair a person’s ability to carry out day-to-day activities. The disease is named for Dr. Alois Alzheimer, who, in 1906, noticed brain tissue changes in a woman who had died of an unexplained mental illness that caused memory loss, language problems, and unpredictable behavior. Registration for the Walk, held on Sidney’s courtsquare, begins at 9 a.m. The opening ceremony starts at 10 a.m. and the walk begins at 10:15 am. • Blue – meaning you are living with Alzheimer’s disease. The flowers will be used in the ceremony and then the walkers may take their flowers on the walk and home at the end of the event. Every registered participant who raises a minimum of $100 will receive a Walk T-shirt if the money is turned in that day. The Alzheimer’s Association was formed in April 1980 to spread awareness and make support programs available. The Walk helps raise money to support the research and outreaches of the association to eradicate the disease. “We are trying to change the way the world sees Alzheimer’s disease. And really change the message. Because even just five years ago, people didn’t talk about Alzheimer’s disease. It was something to be ashamed of, and that’s not the case at all. We want people to talk about it. We want people to better understand it, because there is so much confusion about what Alzheimer’s is,” Reynolds explained. There is currently no way to slow, prevent, or cure Alzheimer’s, Reynolds confirmed. She said there are still a lot of questions about the disease, thus the need for continued research is important, of which the Alzheimer’s Association is the leading health organization for the disease. Every dollar raised goes to support their mission: research to end this disease, and local care and support services for those living with it. Reynolds also said funds raised supports a 24/7 hotline at 1-800-272-3900 which is answered by a licensed councilor or social worker available to help families at anytime. DiAnne Karas, an Edward Jones financial adviser, said her team will be participating in the Walk for the second year in a row. She said also she is proud that Edward Jones serves as the exclusive national presenting sponsor of the Alzheimer’s Association 2018 Walk to End Alzheimer’s. Karas noted that she witnesses daily in her work people’s lives and finances being threatened by situations created by Alzheimer’s disease. “We are trying to help people put together their financial plan, and when we hear from our clients that the disease … that in many cases destroys the finances for both the individual facing the disease and his or her family. So we as a firm are not willing to idly standby and watch our clients lose their loved ones and their hard earned savings,” Karas said of why Edward Jones is involved. You don’t need to know someone with Alzheimer’s to walk next Saturday. Just come walk to show your support. Each year over 600 communities in the U.S. Walk to End Alzheimer’s because everyday, across the country, someone develops Alzheimer’s every 65 seconds, from which there will be no survivors.